Clearly the picture above is not of beef. I flicked through the Claudia Roden book again and decided to try her Beef in Barola for our chums last weekend. Actually it was beef in something else, as recommended by the lovely man at Prohibition Wines in Muswell Hill. I knew Barola was on the pricey side and I also know it’s not a good idea to use cheap wine for cooking – but I had to draw the line at the £34-£40 bottles of Barolo. We got through a shocking amount of wine during the course of the evening and Mr B put the empties straight into the recycling, for the sake of appearances on Sunday morning – so I’m afraid I can’t specify what the alternative was. It was NOT cheap, but nor was it Barolo. However, I don’t think my wine choice explains the non-event that was the beef dish. It was cooked with chopped onion, garlic, celery and carrots, then braised in the wine with a sprig of rosemary. Claudia helpfully said I should simmer the beef for two and a half hours or until tender… She also said that, when I pureéd the wine and vegetables, I would have a lovely creamy sauce. I didn’t. 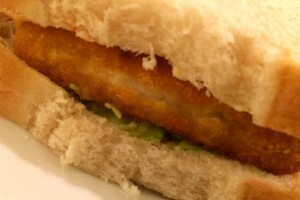 It was runny and not especially lovely. I could have thickened it with some cornflour, but I was feeling dejected by that point and didn’t think of that at the time. Assuming the beef was going to be rather awesome, I kept the rest of the main course simple (roast potatoes, carrots and cabbage). So all in all I was not happy with this particular offering. Even the pictures are rubbish, so I’m not sharing those. 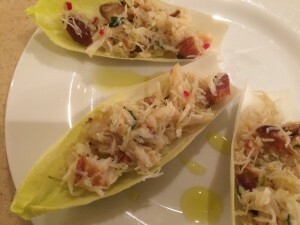 Fortunately we all very much liked the starter pictured above – white crab meat, mixed with chopped red chilli, chopped ginger, zest and juice of a lime, chopped salted almonds, served on endive leaves. Heavenly. 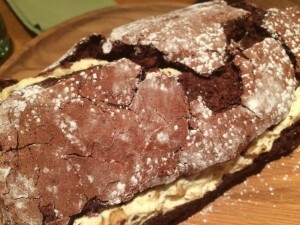 For dessert I made a chocolate roulade filled with cream, mixed with cherries and toasted hazelnuts – a gorgeous combination. I knew it would crack, but I wasn’t expecting it to split entirely down one side. Hey ho – it tasted great. Still was on Monday actually, which was awkward, as I was working at home that day. So there wasn’t much left when the rest of the Battenburgs got home from their labours. By way of contrast – here’s what I had a couple of nights ago.